Mechanix Wear gloves are some of the best designed and most trusted hand wear used by the world's top racing teams. The experience and exposure gained in the racing world has lead Mechanix Wear to branch out its R&D and develop some of the best hard use tactical gloves in the world. Recently, they have taken their incredibly popular M-Pact glove and made it even better with the 2012 version. The Mechanix Wear M-Pact Glove 2012 Version features a new rubberized grip on the thumb, index finger and palm, and molded rubber on the knuckles and fingertips. 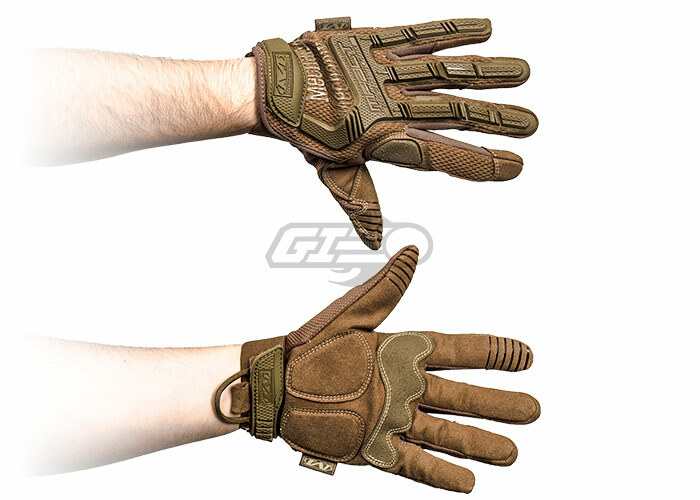 These ensure that you not only have a superior grip on your weapon, increasing your control and accuracy, but they make sure that your hands stay completely protected at the same time. The 2012 M-Pact also features double stitching and dual panels in critical wear areas, a Trek Dry spandex top to keep your hands dry, and a hook and loop wrist closure for a secure fit, and overall provides an incredible advantage over other, less advantageous gloves. -PHENOMINAL value, worth every penny and then some! -I wish I could give these more than a 5 star review, Mechanix hit it out of the park with this design! awesome gloves! fit perfectly, give great protection while allowing dexterity and they are not expensive. used them for a couple years now and i wont be changing them for something else anytime soon. they are showing minimal wear in the time used, and i dont have any rail covers on my 416 rails and those are quite sharp.